The 38th International Glass Invitational at Habatat Galleries took place this past spring and featured over 250 pieces of contemporary Liuli art from 100 of the most influential glass masters in the world. 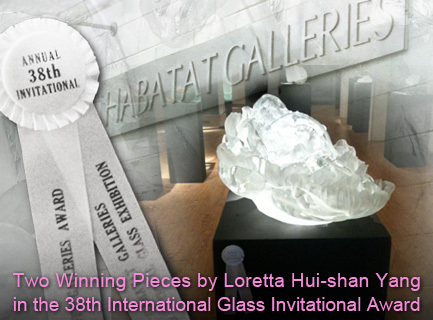 In conjunction with the Washington Museum of Glass, Habatat Galleries presented 20 international glass art awards including two to former 37th International Glass Invitational award recipient Loretta Hui-shan Yang for her “Chrysanthemum Dance” and “Higher Contemplation” pieces. This places Yang on par with noted glass artists such as Martin Blank, Paul Stanker and Ann Wolff.